Constantine was Roman Emperor (A.D. 306-337). 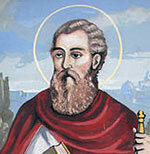 He was the first Roman Emperor to convert to Christianity. With co-Emperor Licinius, he issued the Edict of Milan in 313, which proclaimed tolerance of all religions throughout the empire. Constantine was born in Naissus, Moesia Superior (modern-day Serbia). In 293, the Roman Empire was divided in two by Diocletian, leading to a Western and Eastern Augustus. Constantine received a formal education at Diocletian’s court where he learnt Latin and Greek and was able to mix with a variety of pagan and Christian scholars. However, the time was also a period of widespread persecution of Christians. In 303, Diocletian began the great persecution of Christians which led to widespread arrests, executions, and destruction of Church property. Constantine would later claim he opposed those measures, though it is more likely that he did nothing. In 305, Constantine left the confines of Galerius court and joined his father in Britain, where he made a base in York. On the death of his father, Constantine was declared Augustus, a decision reluctantly accepted by Galerius. There then followed years of turmoil and civil war in which Constantine found himself fighting opponents to Roman rule, but also from within different Roman factions. Constantine was a great military commander winning major victories over the Franks and Alamanni in 306-08, and later against the Visigoths in 332 and the Sarmatians in 334. On 28 October 312, the forces of Maxentius met Constantine’s forces on the river Tiber. Constantine’s army was outnumbered 2:1. But, legends state that in the night he had a significant dream, where he had a vision of Jesus and was told to use the Christian cross. Constantine made his soldiers go into battle with the Christian cross and he made a promise that if successful in battle, he would adopt Christianity. In the battle the following morning, Constantine was decisively victorious, and he was able to enter Rome on the next day. 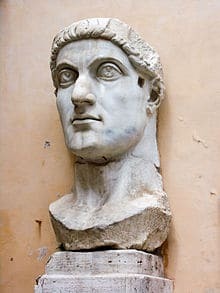 On entering Rome, Constantine embarked on a lengthy propaganda campaign to legitimise his rule and portray himself as a liberator over the tyrant Maxentius. Constantine was able to consolidate his role, proving his military superiority over his rivals. In 313, he signed with Licinius the edict of Milan. This legalised Christianity and allowed freedom of worship. This edict was often ignored, but it was still an important moment with the principle of tolerating Christianity accepted within the Roman empire. Another critical moment in the history of early Christianity was in 325 when he summoned the Council of Nicaea, The Council of Nicaea led to the Nicene Creed, which was the most important tract in formalising what Christianity actually was. The Nicene Creed asserted the view of St Paul that Christ was divine, and made other versions of Christianity, such as Gnosticism and Arianism heretical. Constantine created a new city at Byzantium ‘Constantinople’ (later Istanbul) this was to be the new Rome of the East. The city was famous for its beautiful adornments, fountains and sports venues. Constantine’s Christianity is a matter of conjecture. He didn’t profess Christianity until he was over 40. As well as making a tribute to Christianity; he continued to pay his respect to the old pagan traditions and sacrifices to Apollo and Hercules. Constantine’s mother St Helena was much stronger in her profession of Christian faith. It is believed she was able to influence her son in promoting and protecting Christianity – even if she couldn’t make him share her faith. In 337, Constantine fell ill and tried to make it back to his capital Constantinople. As he was dying he asked to be baptised by the bishops in the River Jordan. In medieval times, Constantine was held up as a model ruler by the Catholic church and presented as a paragon of virtue. However, later historians have questioned the sincerity of his Christian faith. They have presented Constantine as a clever scheming politician who saw the political power of a unified religion, such as Christianity. Citation: Pettinger, Tejvan. 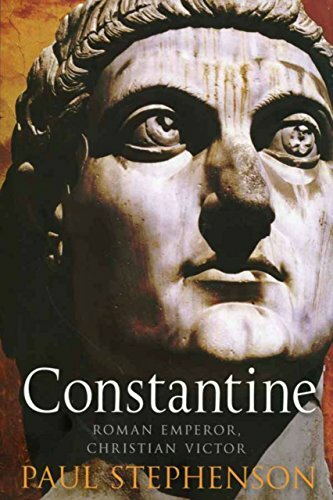 “Biography of Constantine”, Oxford, UK – www.biographyonline.net. Published 17th March 2010. Last updated 6 February 2018.